The shocking behaviour of the Eurozone leaders in punishing Greece for voting against austerity has alarming implications for the future. Is it too late to put democracy and Europe together again? EU summit held in Brussels over Greek financial crisis. Demotix/ Sander de Wilde. All rights rserved.We are living through momentous times when both ideas – democracy and Europe – are at stake. I want to argue that the future of Europe and the future of democracy are inextricably linked and that this matters not only for us in Europe, but for the world. What we will need in the rocky times ahead are critical thinkers who can navigate the rocks. There are two stories I want to use to illustrate our troubled times. One, of course, is Greece. At this very moment, European leaders are meeting (again!) to discuss Greece. It could be the end, in the sense that if no deal is reached, there will be a Greek default and this could easily lead to the unravelling of the Eurozone and, for the time being, the European project - with hugely dangerous consequences. Any more positive outcome is likely to prolong the Greek agony. 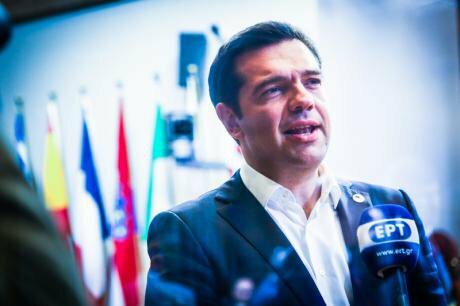 But the main point I want to make is that the outcome is more important for the future of Europe than for the future of Greece. I do believe this is a turning point (perhaps like the invasion of Iraq) when what is decided now will have consequences that we will have to live with for a long time to come. The other story is in Spain and what happened in the recent elections in towns across the country. Anyone in Barcelona at that time, whatever your reservations, had a ringside seat in a democratic experiment – what seems to be a new form of participatory politics linked to new forms of communication. Where does it go from here? Is it the beginning of a new European spring? Or is it the beginning of clashes, fragmentation, and division? And there are many other stories. We just had national elections in Britain. On the face of it, this was a boring conservative victory. But actually it is the story of insurgent parties of both left and right (the Scottish nationalists, the Welsh nationalists, the Greens and the UK Independence Party) who drew the popular vote away from the mainstream left. In order to make sense of these stories, I want to talk first about the meaning of democracy and, second about the European project. Let me start with democracy. What all these stories have in common is a pervasive distrust of the traditional mainstream – La Casta as people say in Spain. A pervasive sense that democracy as it is currently practiced is not working. ‘They call it democracy but it isn’t’ was one of the slogans of the Indignados. In thinking about this problem, I find it useful to make a distinction, often made in democratic theory, between formal and substantive democracy. Formal democracy refers to the procedures and rules of democracy – elections, a rule of law, human rights, constitutionalism and so on. Substantive democracy refers to political equality, the ability of citizens to influence the decisions that affect their lives – the ‘habits of the heart’ as De Tocqueville called it. It parallels a distinction made by Joseph Schumpeter between democracy as a method and democracy as an end in itself. For Schumpeter, democracy was a method of selecting a government, which he likened to a steam engine. Nowadays, we observe the procedures of democracy; it is a method of selecting a government. But it is no longer an end, a way of bringing about meaningful participation. The last three decades have witnessed an astonishing spread of democracy – what Samuel Huntington called the ‘third wave’ of democracy. It has had something to do with globalisation. On the one hand, democracy as a method became a condition for participation in the global system. Along with market reforms, donors and international financial institutions demanded democratic reforms – formal democracy became part of the so-called Washington consensus. On the other hand, the growth of communications – Internet, videos, satellite TV, mobile phones, radio, air travel – has made it very difficult to maintain closed societies; these openings have facilitated new civic movements demanding substantive democracy. When I was young, most states were either under colonial rule or under dictatorships. Now the opposite is the case – there are only a handful of illiberal regimes – Russia, China, North Korea, the middle eastern oil states, Zimbabwe…But there are many countries, including the so-called mature democracies, that suffer from a democratic deficit – profound weaknesses of substantive democracy in our ability to influence the decisions that affect our lives. What are the reasons for this? They have partly to do with globalisation. Important decisions that affect your life are no longer taken at national levels; they are taken in Brussels, Washington DC, Zurich, the headquarters of multinational companies or by young men in front of computers playing the money markets. However perfect the procedures of democracy, voting at a national level will not make it possible to influence the decisions that affect your life if the decisions are taken elsewhere. Greece is a perfect example; the Greek people have voted over and over again against austerity. But their creditors in Frankfurt and elsewhere refuse to agree. Globalisation has also changed the very nature of the state. The growth of global finance in relation to what used to be called the ‘real economy’ – the economy of production involving people – has skewed incomes. We all know that you make much more money from owning property – a house for example – nowadays than from working. The same is true of governments. More and more governments are rentier states whose revenue depends on external aid, borrowing, oil revenues or finance. You may be familiar with the oil curse – the way in which reliance on oil tends to produce a system of corruption upheld through control of the media and the security services. I believe this applies to many states nowadays. My own country Britain, for example, is now heavily dependent on the City of London. But globalisation is not the only reason. The erosion of substantive democracy also has to do with what I call the sclerosis of the nation-state. There was a huge growth of states during and after the Second World War. We tend to think of globalisation as an abstract phenomenon that determines our lives. But of course, it is a social construction. Globalisation was a way of getting around the concentration of power represented by the state; it was the consequence of human action, of people trying to escape the often rigid and paternalistic hold of the state. This included the multinational companies who wanted freer markets and civil society who wanted more peace and human rights. The nation state constrains democracy for many reasons. One is the legacy of the Cold War – the deep state of intelligence services, police and military forces, revived in the framework of counter-terror. Another is the entrenchment of bureaucracy, the way rules and routines narrow the space for choice. Yet a third is the technology of elections, the way the mainstream parties use polling and focus groups in order to concentrate on winning the votes of a narrow band of swing voters and how this means the loss of any grand narrative. The leaders’ debate in Britain was a striking illustration of this. It involved three brilliant women from the insurgent left parties (the Scottish nationalists, the Welsh nationalists and the Greens) with big ideas about the future, three very wooden over-rehearsed men from the three mainstream parties (Conservative, Labour and a Liberal) and a supposedly down to earth man expressing the worst populist prejudices (the United Kingdom Independence Party). So I am saying the problems of democracy have to do both with globalisation and the nation-state. The answer is not to turn back globalisation – after all, the state gave us war and fascism. But nor is the answer untamed globalisation. This is where Europe comes in. So let me turn to Europe. The European project after World War Two was a peace project. In the eighteenth and nineteenth centuries, many great philosophers developed perpetual peace schemes – Jean-Jacques Rousseau, Immanuel Kant, and John Stuart Mill. In many ways, the construction of the European Union bears resemblance to the Kantian scheme, which involved a combination of a permanent peace treaty, republican (or formally democratic) constitutions, and cosmopolitan rights (e.g. human rights). This scheme is not the construction of a super-state like the United States, for example. Rather it is a new form of supra-national co-operation, which restrains the worst characteristics of the nation-state – war, imperialism and repression. The method of construction was economics. The founders of the European Union thought that through what was known as 'low politics', 'high politics' would follow – this was the so-called Monnet method named after the French politician Jean Monnet. For the first three decades, the Monnet method seemed to work; it involved co-operation on infrastructure, agriculture and regional assistance. But everything changed after 1989. This was the heyday of the post-1968 social movements – what we might call the cosmopolitans, who favoured peace and human rights and who wanted to end the Cold War division of Europe. But it was also the heyday of a new generation of neo-liberals, who made use of the left critique of the paternalism and rigidity of the nation-state. The 1991 Maastricht Treaty, which established the single market and the common currency, was a compromise between the cosmopolitans and the neo-liberals, between the passionate Europeanism of Jacques Delors, then the President of the European Commission, and the neo-liberalism of Margaret Thatcher. Many argued that the single currency was a mistake. To establish a single currency without a large central budget, without a fiscal union (for taxation and spending) and without a political union was bound to lead to deep inequalities between creditor and debtor nations, to social exclusion, fragmentation and atomisation. But the late Ulrich Beck pointed out that it was not a mistake; it was a deliberate continuation of the Monnet method. Precisely because it was an impossible project, it created a vested interest in political union. In other words those who agreed to the common currency knew that the project would propel further integration. And this is where we are now. We have reached the point where low politics has to be translated into high politics. Europe has to go forward to survive. It has to integrate further. It has to reverse the rules about austerity. The alternative is dangerous disintegration. The extreme cases of the combination of the legacy of authoritarianism and globalisation are exemplified in the Middle East – Syria, Libya, Egypt, the failed springs. We cannot insulate Europe from the fall-out of these crises as we witness in the tragedies in the Mediterranean. But even more disturbingly, similar combinations of criminality and sectarianism are developing in Europe as a consequence of the economic crisis. So what has to happen if the European project is to be saved? What does it mean for democracy and how could it happen? The aim of the European project should be to restore or build (perhaps we never had it) substantive democracy. The aim is to make it possible for individuals to influence the decisions that affect their lives. How can this be achieved? Yes we need more democracy and accountability at European levels. But Brussels and Strasbourg will always be remote. European and global levels are unlikely to be the sites of active politics. What we need is the ability to take decisions at local levels so that the hopes invested in new experiments in democracy, in the Spanish towns, in Greece, or in the British periphery, are not constantly thwarted. This used to be called subsidiarity. This cannot be achieved through building a European super-state and all that goes with it – surveillance, borders and a military-industrial complex. Rather Europe has to become a new model of global governance – not an instrument of globalisation as it is now, but a mechanism for taming globalisation, for protecting local levels from the storms of globalisation. Europe has to restrain global bads like financial speculation or climate change, and promote global goods like solidarity, peace and human rights in our neighbourhood and beyond. This might be expressed in a new sort of fiscal union, with a new set of taxes aimed at global bads, like a tax on financial speculation or on carbon, and spending on global goods like resource-saving innovation, youth employment, peace-building or redistribution. Unless Europe is transformed in this way, local efforts at democracy will be thwarted and suppressed. But because of globalisation, they are unlikely to be better off outside Europe. Moreover, the future of Europe is critical, not just for Europe but for how we deal with global challenges. So how might this come about? Through lurching from crisis to crisis? What is striking about the Greek crisis is the way in which the creditors and the European Commission and many politicians especially in Germany are hardwired to equate reforms with austerity. The Greeks are saying yes we know we need reforms – we need to cut down on tax evasion, we need to end corruption, we need to democratise public administration. We know we need reforms – we need to end the sclerosis of the nation-state. But reforms cannot mean cuts in pensions, increasing the precariousness of work, and declines in income that lead to even more debt. Yet even though this is said over and over again, the creditors and their political associates don't seem to get it. Nevertheless, this debate about austerity and reforms is beginning to be reproduced in the media. Indeed the solidarity shown by people all over Europe towards Greece perhaps marks the beginning of a European public space. It is a debate we need to have – how to reduce inequality, how to reduce unemployment and homelessness, how to save the planet's resources, how to bring peace to the Middle East. How we get out of the current impasse depends on our contribution to that debate. We need to recapture the European project, to take it back from the global market, to reinstil the original values and more. That’s how we can construct institutions that are different in kind – relevant for the world we live in. It is a huge responsibility. This piece was originally a speech made to the 2015 IBEI graduation ceremony on June 22, 2015.